The classic simplicity of this inspired design is a tribute to the beauty and sophistication of its Danish namesake. 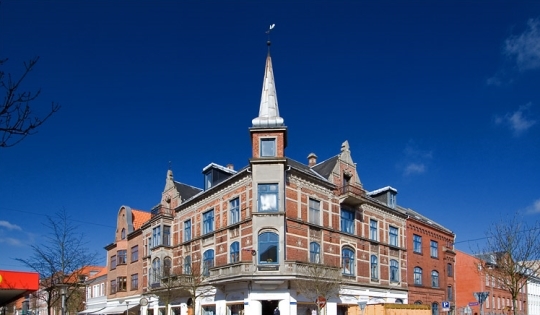 Holstebro has long been known as an important Danish cultural center. The picturesque city has a rich and varied cultural life, enhanced by a multitude of theaters, museums and outdoor sculptures, including Alberto Giacometti’s famous Woman on the Cart. The popular Holstebro Convention and Culture Center hosts over 100 cultural events each year and is visited by more than 100,000 people. With this strong cultural heritage, it is not surprising that this historic town in Western Jutland became the namesake for one of the most artful Johan Eric timepiece collections. The elegant 37 mm stainless steel Holstebro features a simple, uncluttered white dial enhanced with elegant black Roman numerals as indices. The three-hand configuration features two delicate sword hands, along with a free running small seconds sub-dial at 6 o’clock. 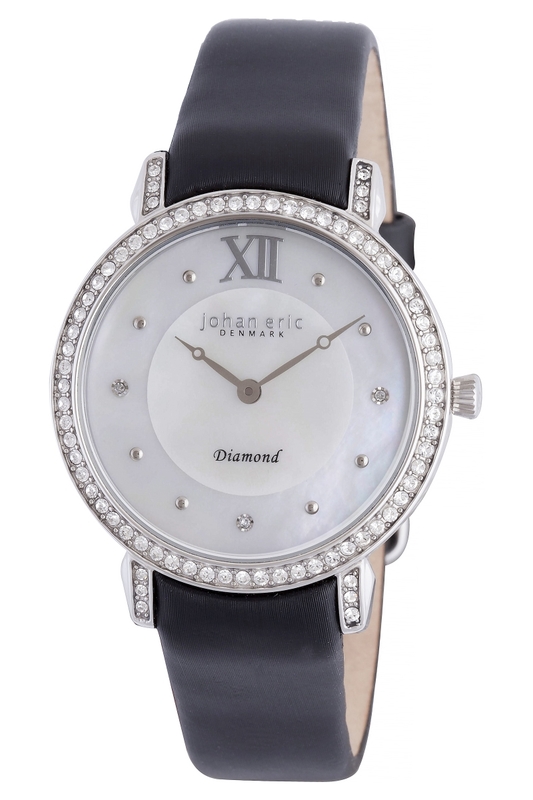 Encircling the sophisticated dial is a spectacular diamond cut bezel that has the appearance of pavé diamonds. 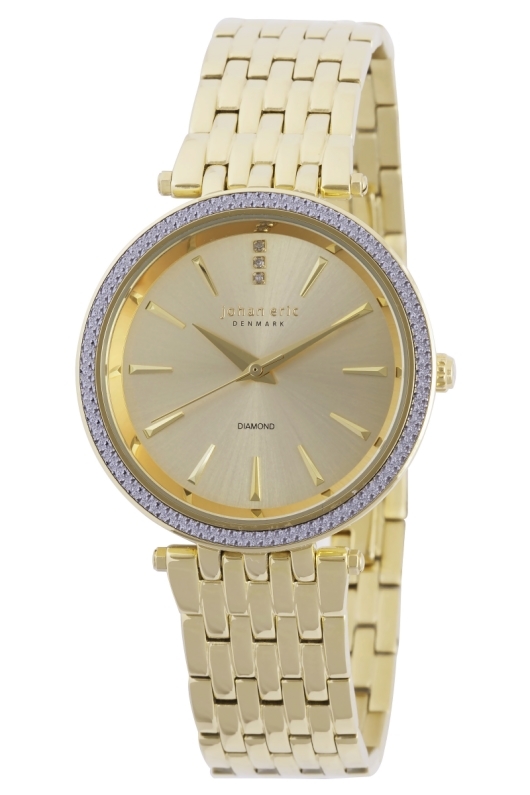 This unique bezel adds a subtle sparkle and shine to the entire watch, making it almost impossible to ignore. 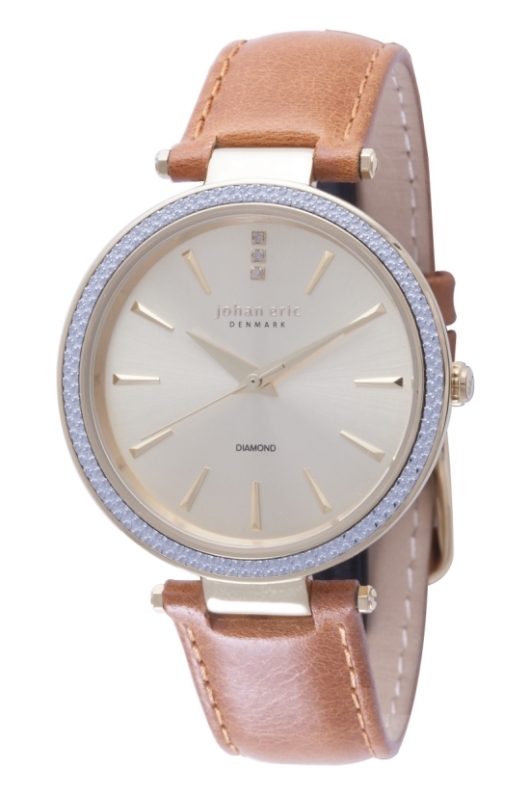 The 37 mm size is ideal for both men and women, making this watch the perfect companion for any dressy occasion. The Holstebro Collection includes six exciting variations. The watch is available in stainless steel, IP yellow gold, or IP rose gold and can be fitted with a matching stainless steel bracelet with a convenient deployment clasp, or a luxurious leather strap with a traditional tang buckle. This artful design is powered by a precision quartz movement that has been engineered to provide years of reliable service and is waterproof to 99 feet. As with all Johan Eric timepieces, the Holstebro carries a two-year manufacturers warranty. The Holstebro Collection’s clean lines and high-quality craftsmanship represent a tremendous value to any watch aficionado. 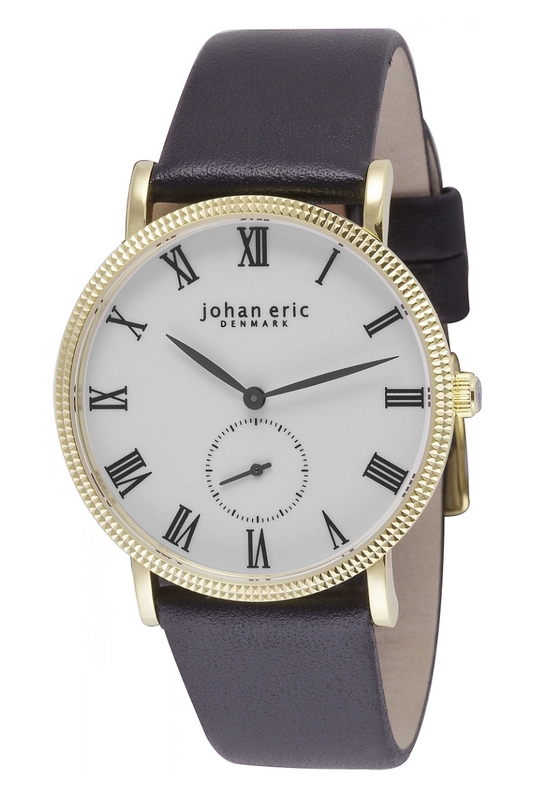 Like all Johan Eric timepieces, the Holstebro is surprisingly affordable. To put one of these artistic masterpieces on your wrist, all you have to do is contact your authorized Johan Eric dealer and ask to see the Holstebro Collection. and a beautiful ladies’ watch all have in common? King Frederick III, who founded the Danish fortress city of Fredericia in 1650, was once considered the most popular man in the kingdom. Frederick’s spirited defense of Denmark against foreign invaders earned him the respect of his countrymen throughout his reign. The popularity of the fabled king and the success of the city that bears his name became the inspiration for an iconic new collection of ladies’ timepieces from Johan Eric. The spectacular Johan Eric Fredericia Collection exemplifies the sophisticated city that Fredericia has become. No longer just a military fortress, Fredericia is now a popular destination for international cruise lines and has become one of Denmark’s largest traffic hubs. 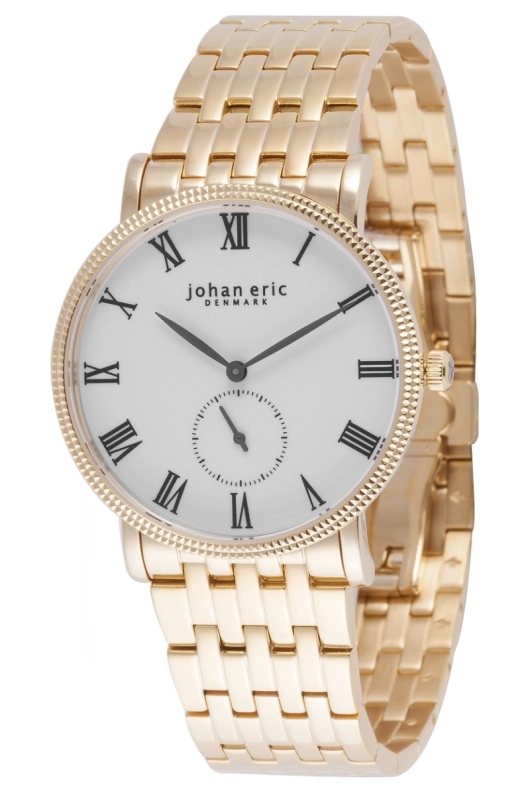 Could the watch that bears this city’s name become Johan Eric’s most popular creation? It’s entirely possible. Like its namesake, Johan Eric Fredericia timepieces transcend convention with classic good looks that appeal to young and old alike. 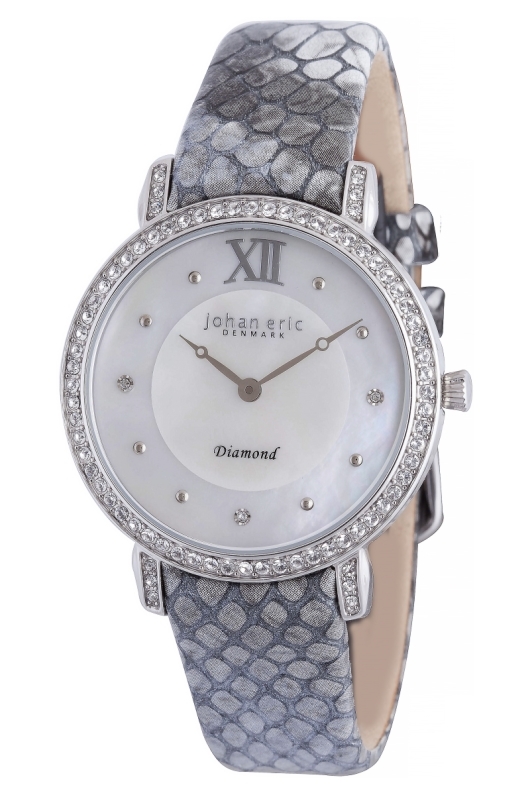 This 36.75 mm masterpiece features a sparkling diamond cut bezel that emulates the look of pavé diamonds. With its minimal three-hand configuration, raised metallic indices, and three genuine diamonds at 12 o’clock, the Johan Eric Fredericia is unmistakable. An IP yellow gold, IP rose gold, or silver sunray dial harmonizes perfectly with your choice of matching IP plated stainless steel bracelets. The watch can also be fitted with a premium genuine leather strap if you prefer. The universal good looks of the Fredericia Collection makes these surprisingly affordable timepieces perfect for both dressy and casual occasions. A precision Miyota GL30 Quartz movement designed to provide years of reliable service powers this superlative timepiece. The Fredericia is water resistant to 99 feet and comes with a scratch resistant mineral glass crystal. If you’re tired of wearing timepieces that immediately go out of style, start wearing a classic on your wrist. We can’t guarantee that your Fredericia will last as long as the Danish city it was named after, but we’re confident you’ll wear it proudly for many years. To see what this timeless classic looks like on your wrist, contact your authorized Johan Eric dealer today and ask to see the Fredericia watch collection. These gorgeous timepieces know how to put on a show; just like the city they were named after. 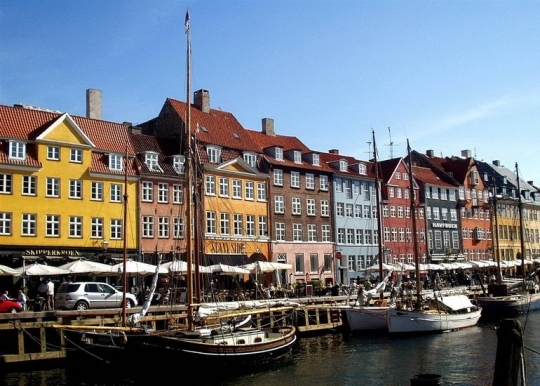 The city of Ballerup, Denmark, located just a few miles from the capital city of Copenhagen, is a vibrant community known for hosting events ranging from the 2014 Badminton World Championship to concerts by Rihanna and the Back Street Boys at one of the largest multi-purpose arenas in Denmark. 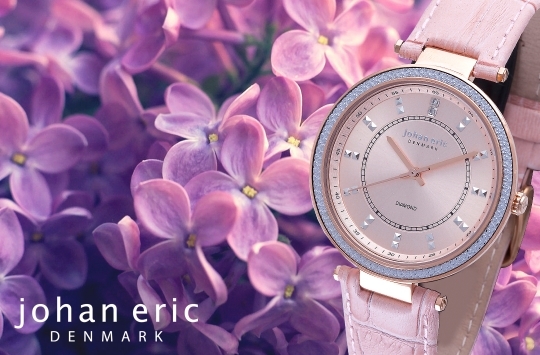 With more than 100 publicly accessible works of art and a strong cultural tradition, it is not surprising that the event friendly city of Ballerup became the namesake for Johan Eric’s glamorous new ladies timepiece collection. 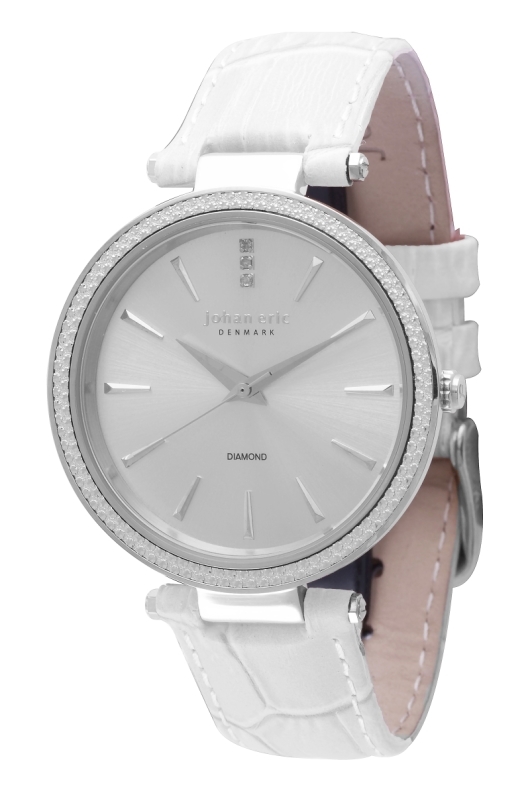 The spectacular 37 mm ladies Ballerup features a unique diamond cut bezel that emulates the look of pavé set diamonds. 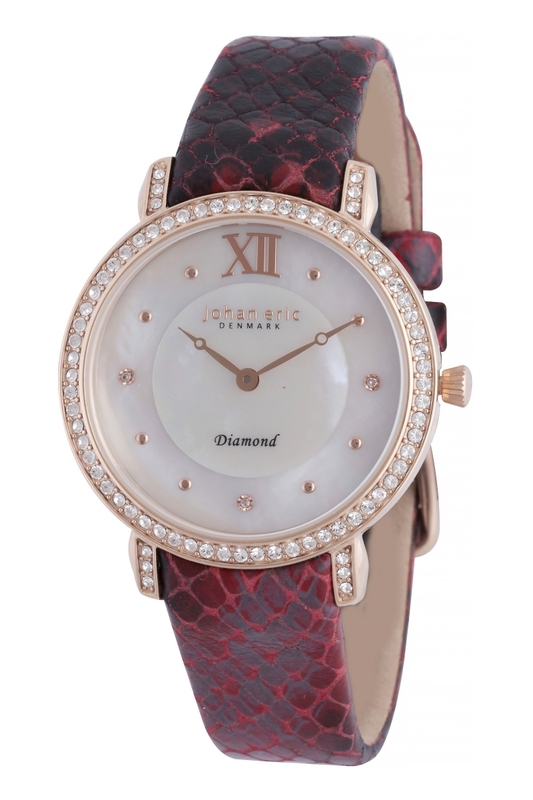 To complement the sparkling bezel are raised diamond shaped indices, with two genuine diamonds at twelve o’clock. 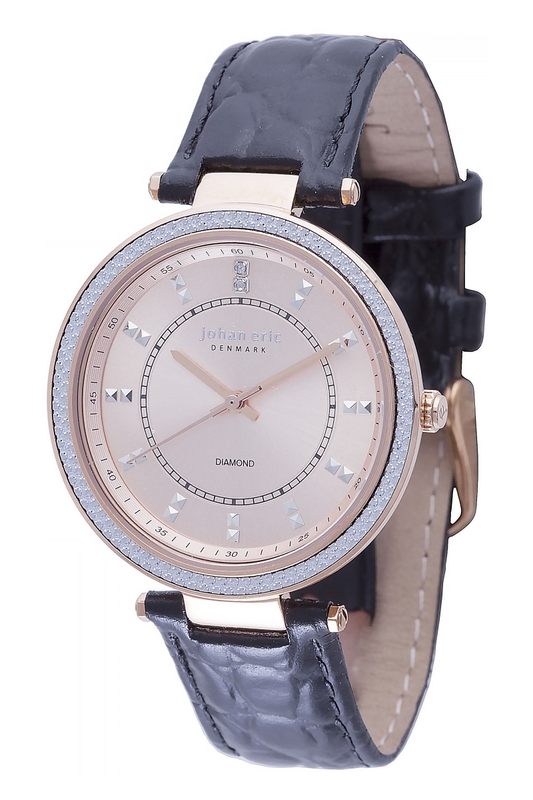 This sophisticated three-hand configuration utilizes unique t-shaped lugs to secure a luxurious textured leather strap, available in a variety of fashion forward colors, including black, white, orchid, and rose. A precision Miyota GL30 Quartz movement housed in a beautifully proportioned stainless steel case powers this stylishly modern ladies timepiece. 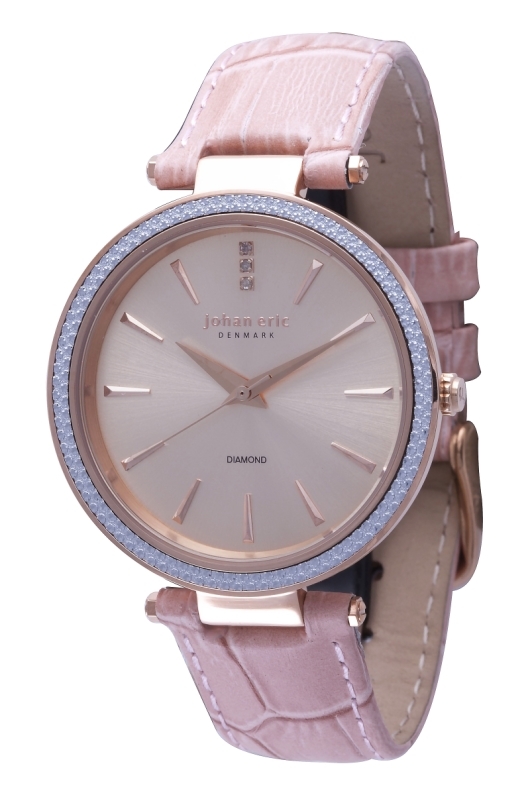 The watch is water resistant to 99 feet and includes a scratch resistant mineral glass crystal to protect the beautiful silver sand, or rose gold sunray dial. 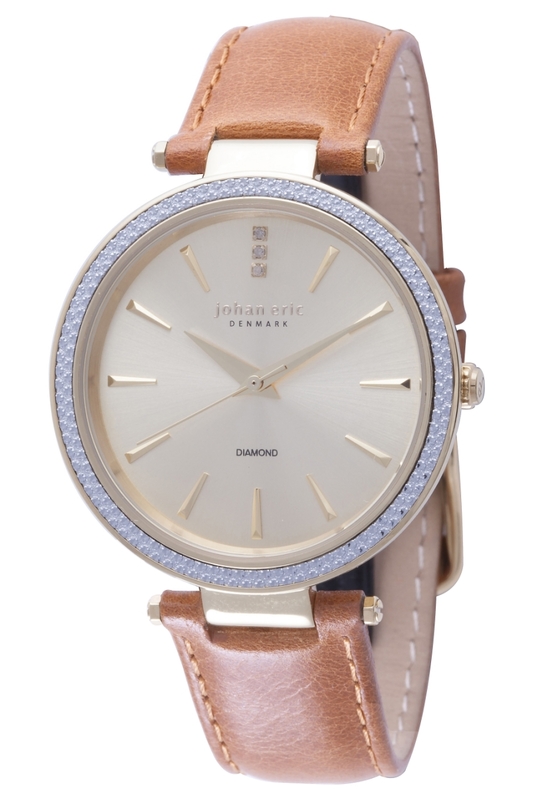 Like all Johan Eric timepieces, the Ballerup Collection skillfully combines the best traditions of Danish Modern Design with the unique characteristics of its namesake city. 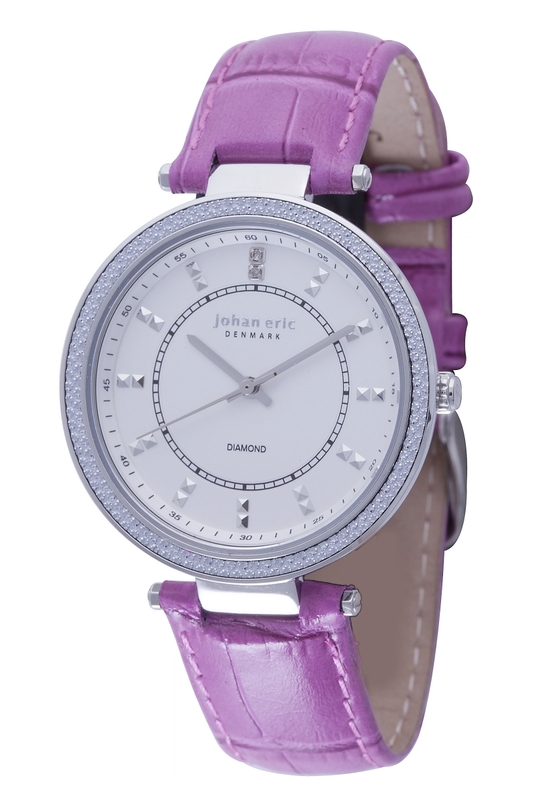 If you enjoy putting on a show when you accessorize your wardrobe, you’ll love the Johan Eric Ballerup Collection. These surprisingly affordable timepieces are flashy enough to catch your attention, while remaining understated enough to enhance the look of both casual and dressy fashions. 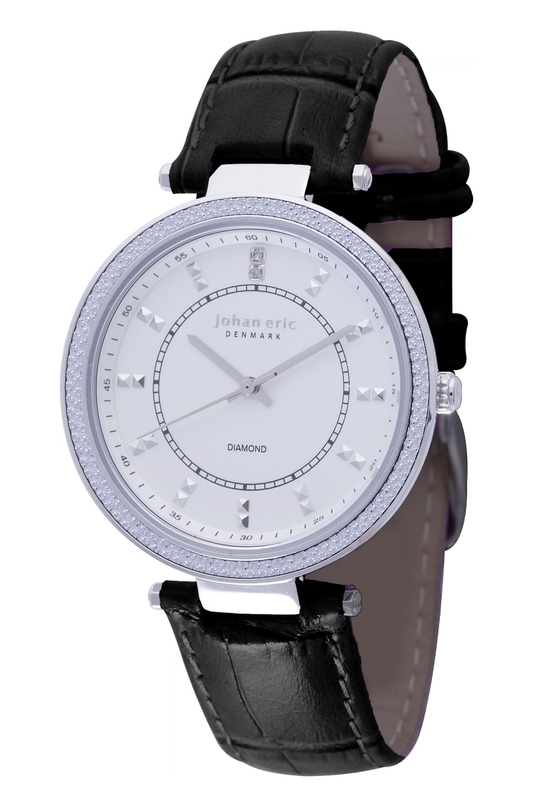 To see what one of these showstoppers looks like on your wrist, contact your authorized Johan Eric dealer today and ask to see the Ballerup Collection. Eclectic charm and classic style characterize Denmark’s oldest town and Johan Eric’s new watch collection. 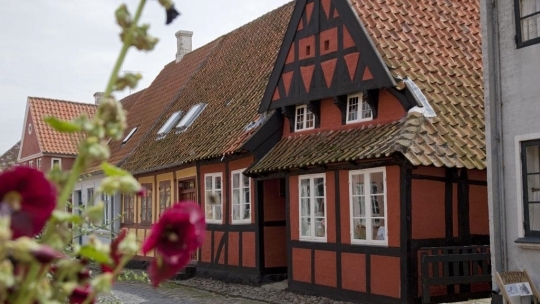 Not only is Ribe the oldest town in Denmark, it is also one of the most charming. The bells of the historic Ribe Cathedral don’t just chime; they play a folksong about Denmark’s Queen Dagmar. European White Storks still build their nests atop the towns many chimneys. The town even has a night watchman who sings to alert citizens that bedtime is approaching. 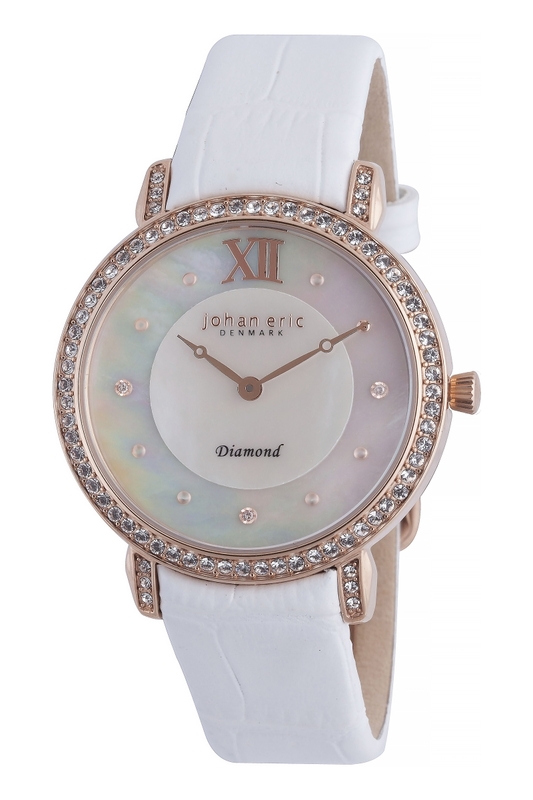 It is no surprise that Johan Eric paid tribute to the city’s unique charm with a wonderful new collection of ladies timepieces. 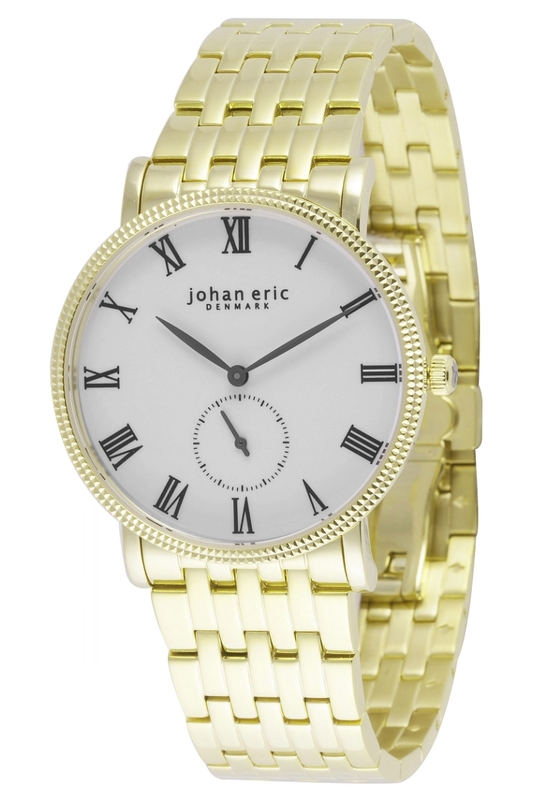 Like its namesake, the Johan Eric Ribe Collection is a mix of classic style, irreverent surprises, and sophisticated fun. The 35 mm stainless steel Ribe features an inspired two-hand configuration with elegant Breguet hands centered in an iridescent mother of pearl dial. The exquisite dial utilizes raised dot indices with three genuine diamonds marking the 3 o’clock, 6 o’clock, and 9 o’clock positions. 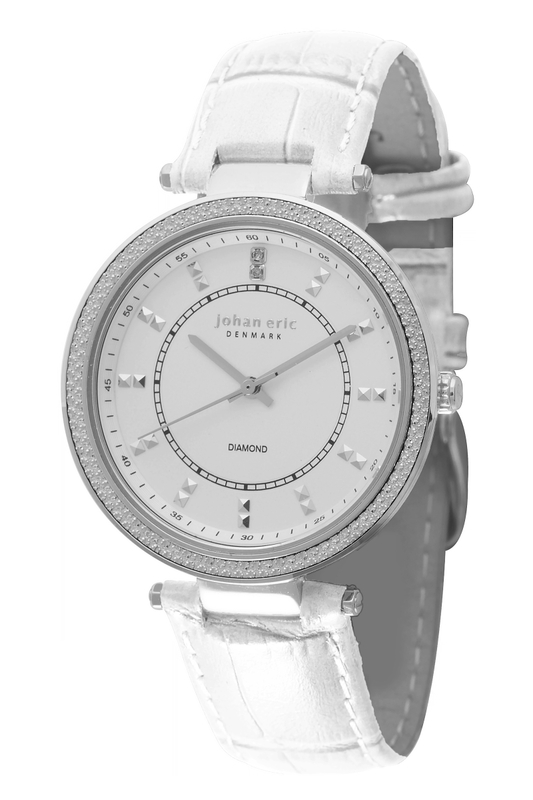 Surrounding the minimally modern dial are 76 sparkling Swarovski crystals on the bezel and lugs. The beautiful IP rose gold case has been fitted with a matching fluted setting crown and is available with a choice of black, white, yellow, or burgundy premium leather straps. A precision Miyota GL26 Japanese quartz movement powers each of these stunning timepieces. 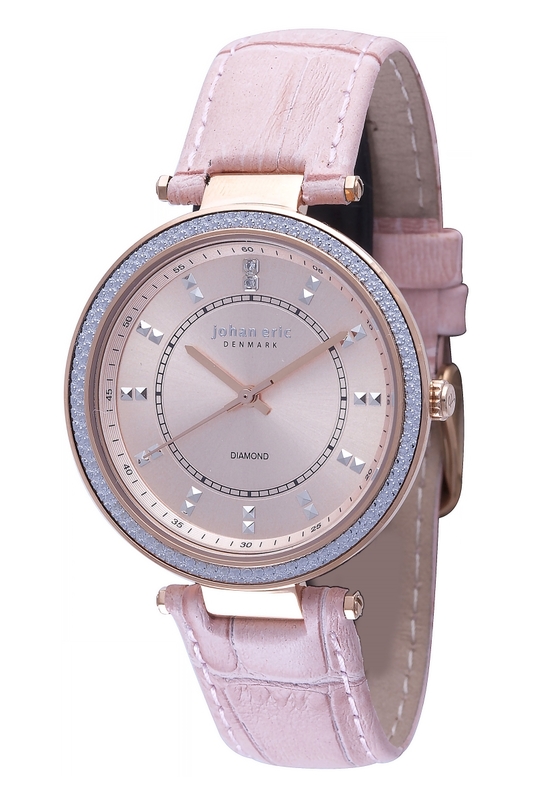 The stylish ladies Ribe is water resistant to 99 feet and includes a durable scratch resistant mineral glass crystal. 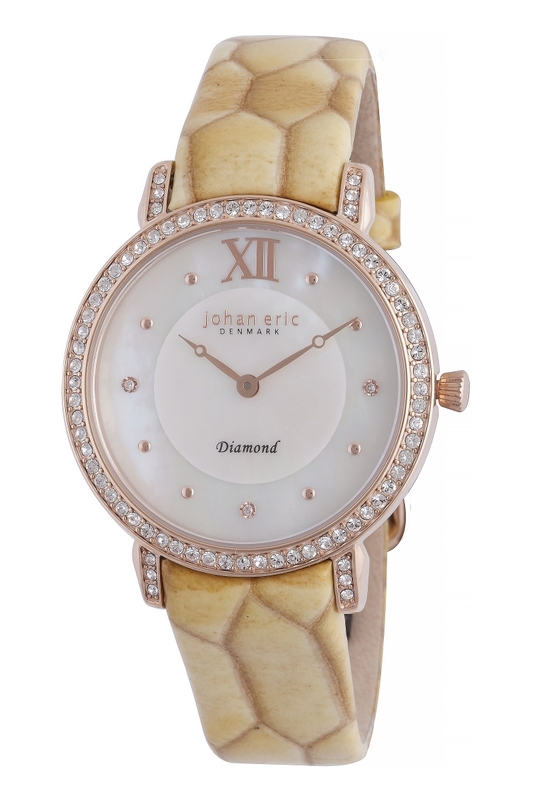 Like all Johan Eric timepieces, the Ribe represents an exceptional value. The craftsmanship and attention to detail on these surprisingly affordable watches is noteworthy. This is a timepiece that fashion forward women will be proud to wear anywhere. The stylish Ribe is the perfect way to accessorize both casual and dressy outfits. If you’d like to see how this charming timepiece looks like on your wrist, contact your authorized Johan Eric dealer immediately and ask to see the Ribe Collection.